Christine has been working in systems to address inequities for individuals and families impacted by historical trauma for over ten years at the city, state and more recently, national level. She is currently working for the Minnesota Department of Health as the Health Equity and Tribal Grants Supervisor for the Office of Statewide Health Improvement Initiatives (OSHII). Her previous work experience of eight years was for the Temporary Assistance for Needy Families program as a counselor and then at the State of Minnesota for the Department Human Services were she served as a Policy Consultant and Tribal Liaison. She holds a Bachelors in Organizational Communication from Augsburg College with a minor in Religion and a Master’s degree in Family Life Education from Concordia University. This interactive workshop topic include; culture and values. 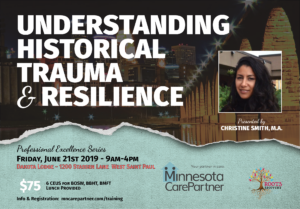 Defining trauma, Adverse Childhood Experiences Minnesota data, Historical and current traumas affecting African American and American Indian people. Bias and myths influencing policies and systems. Finally, healing and resilience through a core protective factors lens.